View More In Bluetooth Headsets. They feature Earhook help to stay in the ears when you are taking exercise or doing something else. Make life easier. Q:Can we use these to answer phone call? A:Yes, they have Built-in mic on the wire and it works great. Q:What devices it is compatible with? Q:Does it work well for Music? A:Yes,with Larger Size Driver and Suitable Sound Chamber,it has good sound performance. Q:What is the remote for? A:The remote answers phone calls for the Phone. It can pause/play/skip for music. What's more, the volume also can be controled by a sliding volume adjuster. Q:Do these have a warranty? A:YES,We offer 12 Months Warranty. When outdoor, we suggest to not make the sound too loud so you can hear if there were any cars passing. 【SMART TOUCH CONTROL】: Touch both L and R for 3s to power on. Music play/stop or answer call/hang up by one slightly touch, double touch to next song and long touch to reject call.Noise cancellation technology reduces ambient noise and echo, enable clear sound no matter in calls or when listening to music. 【SMALLEST & SUPER SOUND QUALITY】 Latest Bluetooth V4.2 with TWS technology to provides faster pairing, stable connection and signal transmission (10meters no-obstacle range). 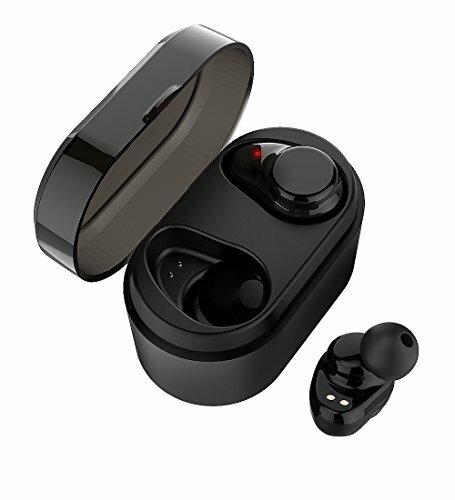 【COMFORT FIT YOUR EAR】Wireless earbuds is carefully designed according to ear geometry , 3 different sizes of soft ear cups included for staying in your ear . Light weight and sweatproof allowing running, jogging, and high intensity activities to be enjoyable. 【SMART STEREO MODE & MONO MODE】 The earbuds can be used dual or separately as you wish, which means you can share the same music/movies with friends and enjoy the clear stereo sound by using both headset. But only the master headset has sound when at the calling mode, this safety feature allows you to hear the traffic while driving. 【LONGER BATTERY LIFE WITH STORAGE BOX】 Equipped 1000mAh battery in the portable magnetic charging box,which can support 5 times fully charging for the wireless earbuds. You can enjoy up to 2 hours of music time at single charger . If you have any questions about this product by Langsdom, contact us by completing and submitting the form below. If you are looking for a specif part number, please include it with your message.